“Ahh, fresh meat”. Those now immortal words of Diablo’s infamous first real antagonist, the Butcher, give an apt foreshadowing of what is to come. Diablo and its sequels are like a butcher’s meat grinder. A haunting experience where players find themselves faced with a never ending onslaught of ungodly creatures. Your journey concluding by facing down the ultimate evil himself: Diablo. A player’s journey in Diablo starts off simple enough with the choosing of a character class and a name. Each class has attributes pre-allocated and a special skill. The Warrior specializes in melee weaponry and repair. Archery and trap disarming are handled by the Rogue. Finally the Sorcerer specializes in powerful spells and the ability to charge magical staves. Further abilities however are not locked in to your class selection – new skills and spells are acquired by finding or buying arcane tomes and can be learned by any class – as long as they have the required attributes. Classes also have assigned speeds of attack, casting, and blocking. Great depth in customization wouldn’t come until Diablo II. Diablo excels at world building. Tristram is a quaint little gothic town that’s church sits on top of a mysterious labyrinth. Each new game has a randomly generated dungeon where the adventure takes place. But your first experience isn’t killing monsters or grabbing items. It’s the serene sounds of one of the best single tracks in gaming history. Strong voice acting and nuanced dialog introduce you to the world in Diablo. 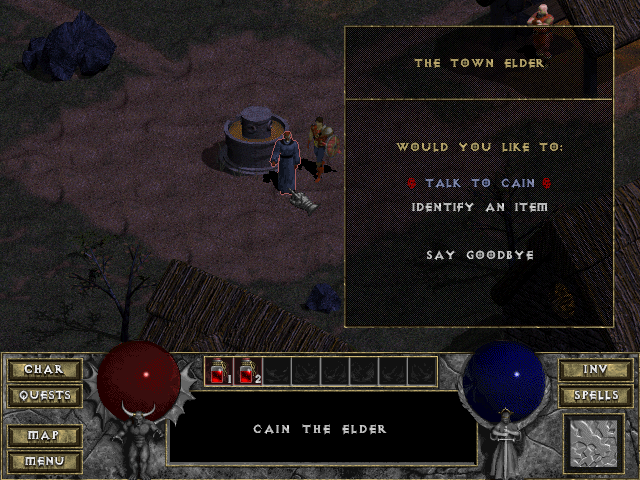 Each of Tristram’s cast tells a part of the story through quality voiced dialog in addition to their gameplay functions. The cast of characters, music, and gothic styled art of the town create an atmosphere where the player always wants to learn more. As you delve deeper into the dungeon you’ll find books detailing past events such as the possession of the prince, the King’s subsequent madness, or details on unique quests. The plot itself fails to live up to such great world building as your mission is laser focused on ridding the town of evil and defeating Diablo. Diablo’s core gameplay is built on an addictive foundation of killing monsters, leveling up, finding items, and doing this over and over again. This gameplay loop became so popular that it spawned an entire sub-genre known as “Diablo-clones”. Killing monsters is simple. Left-click to attack, right-click to use spells and press the numbered keys to consume potions in the hot bar. Monsters comes in various shapes and forms – including color palette swaps – and occasionally you’ll also encounter unique fiends that come with special abilities and resistances. Experience gained from killing monsters eventually leads to a level up where you can allocate 5 points to Strength, Dexterity, Vitality, or Magic. Each of these affect derived statistics like damage, chance to hit, life, and mana. What makes this loop fun is the item system. Each item you find will be randomly generated from a preset pool of qualities. Regular items have no special properties; just a damage or armor rating. Magical items combine a prefix and suffix attribute which provide various bonuses to your character. It could be faster attack speed, additional character stats, or even curses. And Unique items are extremely rare and powerful. Diablo captures players with the constant promise of a better item just around the corner, maybe in the next chest or enemy, driving you to keep fighting monsters till the early hours of the morning. Together with Diablo, Blizzard also launched the Battle.net service, where you could play competitively or cooperatively online. The big downside was the rampant cheating, as Blizzard did not police hacks and exploits much. This alienated some from online play, so the company was much fiercer in enforcing anti-cheating measures on future titles. Diablo also saw an expansion called Hellfire. It brought some welcome convenience features like the ability to move faster in town. Oddly, Hellfire was not developed by the same team or even company, so it lacks the same consistent quality as the base game. Still, extra content in the way of a new class – the Monk –, item upgrades and quests make Hellfire worthwhile for Diablo veterans, and some features would eventually work their way into Diablo II.